1Department of Medicine, National University Hospital, National University Health System, Singapore 119228, Singapore. 2Department of Medicine, Yong Loo Lin School of Medicine, National University of Singapore, Singapore 119228, Singapore. 3Department of Neurology, Mercy University Hospital, Grenville Place, Cork, Ireland. Correspondence Address: Dr. Amy May Lin Quek, Department of Medicine, National University Hospital, National University Health System, National University Hospital Tower Block, 1E Kent Ridge Road, Singapore 119228, Singapore. Recent, discoveries of neural antibodies have facilitated the diagnosis of immune-mediated, immunotherapy-responsive neurologic disorders. Antibodies that target inhibitory central nervous system receptors, such as γ-aminobutyric acid-B, γ-aminobutyric acid-A, and glycine receptors, disrupt inhibitory regulatory synaptic functions, and lead to neuronal hyperexcitability. The myriad of neurologic, manifestations associated with these antibodies includes seizures, encephalopathy, muscle rigidity and stiffness. This article provides a review of the immunopathogenic mechanisms and the clinical and therapeutic implications of autoimmune encephalitis associated with these antibodies that target inhibitory receptors. Recent, discoveries of neural antibodies that bind to antigenic targets in the brain have led to a paradigm shift in the clinical approach to patients presenting with encephalopathy,[1-4] cognitive change, and refractory seizures. [4,6] With a wider availability of neural antibody testing, a significant proportion of the patients, who were previously diagnosed with encephalitis of undetermined etiology have been shown to have neurologic symptoms caused by an underlying autoimmune disorder and some of these patients respond favorably to immunosuppressive treatments. Neural antibodies that, target channels or receptors on the neuronal cell surface can interfere with the function of these proteins, leading to altered neuronal excitability, and a myriad of neurologic syndromes that mirror genetic and pharmacologically induced disorders of the target receptors. In this review, we describe the immunopathogenic mechanisms of autoimmune encephalitis associated with antibodies targeting the inhibitory synaptic receptors γ-aminobutyric acid-B (GABAB), γ-aminobutyric acid-A (GABAA), and glycine receptors (GlyRs), together with their clinical and therapeutic implications. GABA, the main inhibitory neurotransmitter in the brain, binds to metabotropic and ionotropic receptors to regulate neuronal activity. To date, GABAB receptor (GABABR) and GABAA receptor (GABAAR) have been identified as antigenic targets of autoimmunity [Table 1]. The GABABR is a metabotropic G-protein-coupled receptor on presynaptic, postsynaptic, and extrasynaptic membranes, expressed in both the central and peripheral nervous systems, particularly the hippocampus, thalamus, and cerebellum. This receptor is a heterodimer comprising two subunits: GABAB1 and GABAB2. Both subunits need to be co-expressed in order to form a functional receptor. [9,10] The extracellular domain of the GABAB1 subunit binds to GABA while the GABAB2 subunit couples the receptor with the effector G protein. Antibodies to GABABR bind to the B1 subunit of the GABABR, the component that is required for GABA binding and receptor function. GABABR exert inhibitory regulatory effects on synaptic transmission by inhibiting presynaptic voltage-gated calcium channel-mediated neurotransmitter release and by activating postsynaptic potassium channels, resulting in hyperpolarization of neuronal membranes, and inhibition of adenylate cyclase. [11,12] GABABR dysfunction is implicated in a variety of neurological disorders such as epilepsy, in which genetic mutations may play a role. [13,14] Pharmacological disruption of the GABABR leads to seizures, cognitive deficits, and behavioral changes,[10,15,16] all of which may be seen in autoimmune anti-GABABR limbic encephalitis. Antibodies to GABABR were first described in 15 patients with limbic encephalitis, in whom subacute early onset of seizures was a distinctive feature. Seizures were predominantly of temporal lobe onset with secondary generalization, and 3 of the 15 patients developed status epilepticus. Memory impairment, confusion, hallucinations, and behavioral changes consistent with limbic involvement were frequently seen. Electroencephalography (EEG) changes included epileptiform discharges, electrographic ictal activity, and/or temporal lobe slowing. Magnetic resonance imaging (MRI) brain imaging typically demonstrates unilateral or bilateral increased T2/fluid attenuated inversion recovery signal changes in the medial temporal region, consistent with limbic encephalitis. [4,17] Extratemporal changes in the grey and white matter, cerebellum, basal ganglia, and brainstem have also been reported. [4,17-19] Cerebrospinal fluid (CSF) examination may yield lymphocytic pleocytosis, elevated protein, and oligoclonal bands. As with other types of limbic encephalitis, the EEG, MRI brain, and/or CSF exam may be normal, and should not preclude the diagnosis or presumptive treatment when the clinical presentation is suspicious. The GABAAR is a ligand-gated ion channel located at synaptic and extrasynaptic sites that functions to mediate fast inhibitory synaptic transmission. [25,26] Activation of the GABAAR triggers opening of intrinsic chloride channels, thereby eliciting an inhibitory postsynaptic potential. Disruption of GABAAR results in increased neuronal excitability and seizures. Mutations in the α1 and β3 subunits of the GABAAR gene have been implicated in epilepsy syndromes. [27-29] Benzodiazepine and barbiturate, medications used for the treatment of seizures and status epilepticus, enhance GABAergic inhibition to exert an anticonvulsant effect. GABAARs are pentamers comprising combinations of five subunits that form chloride ion channels. Different combinations of subunits result in functional heterogeneity. Synaptic GABAARs, which contain the α (α1-3), β, and γ subunits, are responsible for phasic inhibition. By contrast, extrasynaptic and perisynaptic GABAARs, which are responsible for tonic inhibition, comprise α4 or α6 subunits combined with β and δ subunits. The GABAAR antibody binds to the α1,β3, or both subunits of the synaptic GABAAR. [32,33] GABAAR antibodies reduce the density of the GABAAR at synaptic sites when applied to rat hippocampal neurons, suggesting that antibody binding leads to the relocation of GABAAR from the synaptic membrane. [32,33] This phenomenon is similar to the loss of synaptic GABAAR and resultant neuronal hyperexcitability observed in epilepsy and status epilepticus. The combined reinforcing effects of antibody-mediated synaptic GABAAR relocation, together with the status epilepticus-induced loss of GABAAR, could support a postulated model to explain the severity of seizures in patients with anti-GABAAR encephalitis. GABAAR antibodies are reported in both children and adults (age 2-74 years), but larger cohorts need to be characterized. A low frequency of tumors in seropositive patients has been reported. In the initially published study of 18 patients, only one patient was found to have cancer (Hodgkin lymphoma). Two recent additionally reported cases had invasive thymoma. The electroencephalograms of patients with anti-GABAAR encephalitis may demonstrate generalized slowing suggestive of encephalopathy, multifocal ictal and interictal discharges, or status epilepticus. CSF findings range from normal to lymphocytic pleocytosis. Distinctive to GABAAR antibodies, the majority of patients, especially those with high antibody titers, had extensive temporal and extratemporal MRI brain abnormalities which could be a consequence of autoimmune inflammation in the brain or prolonged ictal activity. The extensive radiologic changes contrast with those of patients with limbic encephalitis associated with other neuronal synaptic and cell surface antibodies, such as NMDAR and VGKC-complex antibodies, in which MRI abnormalities are often confined to the mesial temporal regions. Despite the severity of their presentation, 80% of the patients reported with anti-GABAAR encephalitis demonstrate partial or complete recovery with a combination of immunotherapy, antiepileptic drugs, and supportive treatment. [32,33] In severe cases, multiple immunotherapies may be required. Treatment options are the same as with GABABR and GlyR antibody mediated disorders. In addition to immunotherapy, early recognition and treatment of epilepsy, as well as supportive treatment (including ventilation support) are pivotal. GlyRs, pentamers of α1-α4 and β-subunit proteins, are ligand-gated chloride ion channels, widely distributed in the CNS. They are predominantly expressed in the olfactory bulb, retina, hippocampus, brainstem (auditory, visual, vestibular, and sensory nuclei), cerebellum, and spinal cord. [37,38] Glycine binding mediates opening of the GlyR chloride channel, resulting in hyperpolarization of the membrane potential and reduced neuronal excitability. The GlyR antibody targets the α1 subunit of the postsynaptic GlyR and is associated with hyperexcitable neurologic disorders [Table 1].Gephyrin allows multiple GlyR to cluster together on the synaptic membrane. Antibodies to gephyrin, an anchoring protein in the postsynaptic GlyR, have been described only in a single case to date. GlyR antibodies may be detected in both serum and/or the CSF. [39,59] CSF evaluation is possibly more sensitive than serum, therefore testing both is recommended. CSF lymphocytic pleocytosis or raised protein may be seen, and oligoclonal bands were negative in 50-70% of 2 case series recently published. [39,56] Imaging is typically normal. Rarely, MRI temporal lobe T2-weighted abnormality with subsequent hippocampal volume loss is detected, particularly in cases associated with significant seizure activity. EEG may be normal, or show features of focal or generalized ictal activity. A combination of immunotherapies (corticosteroids, IVIg, PLEX, cyclophosphamide), pharmacological therapies targeting symptoms of motor hyperexcitability and pain (clonazepam, diazepam, baclofen, gabapentin), and anticonvulsants (levetiracetam) are required to control clinical symptoms. [39,42] Eighty percent of patients with GlyR antibodies showed a substantial response to immunotherapy. [39,42] Two cases were reported that responded dramatically to thymectomy in addition to other immunotherapy. [39,60] In the largest case series to date, 6 out of 52 (12%) patients continued to have sporadic relapses whilst on treatment. An increased awareness of the autoimmune mechanisms underlying cases of noninfective encephalitis and/or refractory seizures has led to increased recognition, earlier treatment, and improved outcomes in a subgroup of patients previously considered untreatable. Antibodies targeting the inhibitory receptors GABAB, GABAA, and glycine are three more recently appreciated, but important antibodies to consider in refractory seizure disorders and encephalitis of unclear etiology. A high index of suspicion and an awareness of the expanding clinical spectrum of these antibody-mediated disorders should prompt early neural antibody testing in patients with typical constellations of neurological symptoms, in particular refractory seizure disorders and encephalitis of unclear etiology. Once identified early, these conditions may be responsive to immunotherapy. There are sparse data to recommend one immunotherapeutic regime over another. Large cohort studies of patients with anti-NMDAR encephalitis suggest that first line therapy should comprise corticosteroids, IVIg, and/or PLEX, followed by second line immunotherapy (cyclophosphamide, rituximab, or both) in patients who fail to respond to initial treatment. A practical approach, guided by the literature on autoimmune encephalitis with antibodies against neuronal surface antigens, is suggested in Figure 1. Immunotherapy needs to be complemented by supportive, symptomatic medical therapy. There is a consensus that early treatment confers better outcomes. Age and antibody appropriate tumor screening should be performed in all cases and may be aided by testing for other co-existing neural antibodies. The neurologic hyperexcitability effects of antibody binding to GABAA, GABAB, and GlyRs (and potentially other receptors in the future) reflect the important functions mediated by these inhibitory neuronal synaptic receptors. More research is needed in order to better understand this novel category of immune-mediated encephalitis. Further studies could focus on immunopathogenic mechanisms of these antibodies in causing disease, as these may be potential targets for directed treatment. To date, the numbers of patients reported with these antibodies remain small, with most cases retrospectively identified. With increasing access to testing for neural antibodies, the clinical spectrum of these autoimmune encephalitides may continue to expand. Systematic studies of prospectively identified, newly diagnosed cases should help to provide data on the long-term course of the disease, prognostic factors, and optimal immunotherapeutic regimes. 1. Dalmau J, Tuzun E, Wu HY, Masjuan J, Rossi JE, Voloschin A, Baehring JM, Shimazaki H, Koide R, King D, Mason W, Sansing LH, Dichter MA, Rosenfeld MR, Lynch DR. Paraneoplastic anti-N-methyl-D-aspartate receptor encephalitis associated with ovarian teratoma. Ann Neurol 2007;61:25-36. 2. Lai M, Hughes EG, Peng X, Zhou L, Gleichman AJ, Shu H, Mata S, Kremens D, Vitaliani R, Geschwind MD, Bataller L, Kalb RG, Davis R, Graus F, Lynch DR, Balice-Gordon R, Dalmau J. AMPA receptor antibodies in limbic encephalitis alter synaptic receptor location. Ann Neurol 2009;65:424-34. 3. Lai M, Huijbers MG, Lancaster E, Graus F, Bataller L, Balice-Gordon R, Cowell JK, Dalmau J. Investigation of LGI1 as the antigen in limbic encephalitis previously attributed to potassium channels: a case series. Lancet Neurol 2010;9:776-85. 4. Lancaster E, Lai M, Peng X, Hughes E, Constantinescu R, Raizer J, Friedman D, Skeen MB, Grisold W, Kimura A, Ohta K, Iizuka T, Guzman M, Graus F, Moss SJ, Balice-Gordon R, Dalmau J. Antibodies to the GABA(B) receptor in limbic encephalitis with seizures: case series and characterisation of the antigen. Lancet Neurol 2010;9:67-76. 5. Flanagan EP, McKeon A, Lennon VA, Boeve BF, Trenerry MR, Tan KM, Drubach DA, Josephs KA, Britton JW, Mandrekar JN, Lowe V, Parisi JE, Pittock SJ. Autoimmune dementia: clinical course and predictors of immunotherapy response. Mayo Clin Proc 2010;85:881-97. 6. Quek AM, Britton JW, McKeon A, So E, Lennon VA, Shin C, Klein C, Watson RE Jr, Kotsenas AL, Lagerlund TD, Cascino GD, Worrell GA, Wirrell EC, Nickels KC, Aksamit AJ, Noe KH, Pittock SJ. 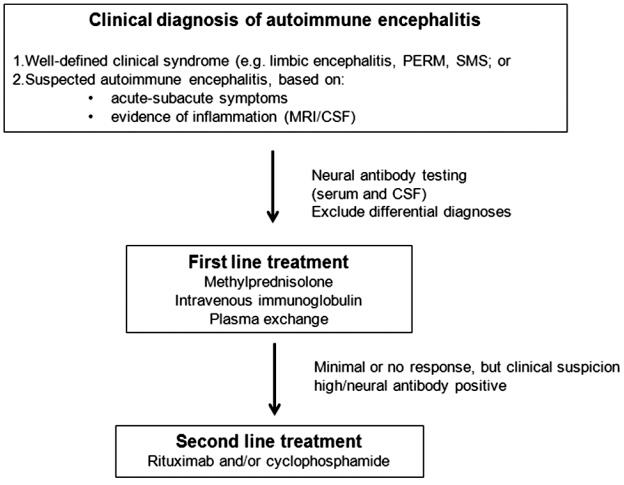 Autoimmune epilepsy: clinical characteristics and response to immunotherapy. Arch Neurol 2012;69:582-93. 7. Gable MS, Sheriff H, Dalmau J, Tilley DH, Glaser CA. The frequency of autoimmune N-methyl-D-aspartate receptor encephalitis surpasses that of individual viral etiologies in young individuals enrolled in the California Encephalitis Project. Clin Infect Dis 2012;54:899-904. 8. Lancaster E, Martinez-Hernandez E, Dalmau J. Encephalitis and antibodies to synaptic and neuronal cell surface proteins. Neurology 2011;77:179-89. 9. Bettler B, Kaupmann K, Mosbacher J, Gassmann M. Molecular structure and physiological functions of GABA(B) receptors. Physiol Rev 2004;84:835-67. 10. Gassmann M, Shaban H, Vigot R, Sansig G, Haller C, Barbieri S, Humeau Y, Schuler V, Muller M, Kinzel B, Klebs K, Schmutz M, Froestl W, Heid J, Kelly PH, Gentry C, Jaton AL, Van der Putten H, Mombereau C, Lecourtier L, Mosbacher J, Cryan JF, Fritschy JM, Luthi A, Kaupmann K, Bettler B. Redistribution of GABAB (1) protein and atypical GABAB responses in GABAB(2)-deficient mice. J Neurosci 2004;24:6086-97. 11. Benarroch EE. GABAB receptors: structure, functions, and clinical implications. Neurology 2012;78:578-84. 12. Bowery NG, Bettler B, Froestl W, Gallagher JP, Marshall F, Raiteri M, Bonner TI, Enna SJ. International Union of Pharmacology. XXXIII. Mammalian gamma-aminobutyric acid(B) receptors: structure and function. Pharmacol Rev 2002;54:247-64. 13. Gambardella A, Manna I, Labate A, Chifari R, La Russa A, Serra P, Cittadella R, Bonavita S, Andreoli V, LePiane E, Sasanelli F, Di Costanzo A, Zappia M, Tedeschi G, Aguglia U, Quattrone A. GABA(B) receptor 1 polymorphism (G1465A) is associated with temporal lobe epilepsy. Neurology 2003;60:560-3. 14. Wang X, Sun W, Zhu X, Li L, Wu X, Lin H, Zhu S, Liu A, Du T, Liu Y, Niu N, Wang Y, Liu Y. Association between the gamma-aminobutyric acid type B receptor 1 and 2 gene polymorphisms and mesial temporal lobe epilepsy in a Han Chinese population. Epilepsy Res 2008;81:198-203. 15. Enna SJ, Bowery NG. GABA (B) receptor alterations as indicators of physiological and pharmacological function. Biochem Pharmacol 2004;68:1541-8. 16. Mombereau C, Kaupmann K, Froestl W, Sansig G, van der Putten H, Cryan JF. Genetic and pharmacological evidence of a role for GABA(B) receptors in the modulation of anxiety- and antidepressant-like behavior. Neuropsychopharmacology 2004;29:1050-62. 17. Hoftberger R, Titulaer MJ, Sabater L, Dome B, Rozsas A, Hegedus B, Hoda MA, Laszlo V, Ankersmit HJ, Harms L, Boyero S, de Felipe A, Saiz A, Dalmau J, Graus F. Encephalitis and GABAB receptor antibodies: novel findings in a new case series of 20 patients. Neurology 2013;81:1500-6. 18. Kruer MC, Hoeftberger R, Lim KY, Coryell JC, Svoboda MD, Woltjer RL, Dalmau J. Aggressive course in encephalitis with opsoclonus, ataxia, chorea, and seizures: the first pediatric case of gamma-aminobutyric acid type B receptor autoimmunity. JAMA Neurol 2014;71:620-3. 19. Mundiyanapurath S, Jarius S, Probst C, Stocker W, Wildemann B, Bosel J. GABA-B-receptor antibodies in paraneoplastic brainstem encephalitis. J Neuroimmunol 2013;259:88-91. 20. Jeffery OJ, Lennon VA, Pittock SJ, Gregory JK, Britton JW, McKeon A. GABAB receptor autoantibody frequency in service serologic evaluation. Neurology 2013;81:882-7. 21. Kim TJ, Lee ST, Shin JW, Moon J, Lim JA, Byun JI, Shin YW, Lee KJ, Jung KH, Kim YS, Park KI, Chu K, Lee SK. Clinical manifestations and outcomes of the treatment of patients with GABAB encephalitis. J Neuroimmunol 2014;270:45-50. 22. Boronat A, Sabater L, Saiz A, Dalmau J, Graus F. GABA(B) receptor antibodies in limbic encephalitis and anti-GAD-associated neurologic disorders. Neurology 2011;76:795-800. 23. Jarius S, Steinmeyer F, Knobel A, Streitberger K, Hotter B, Horn S, Heuer H, Schreiber SJ, Wilhelm T, Trefzer U, Wildemann B, Ruprecht K. GABAB receptor antibodies in paraneoplastic cerebellar ataxia. J Neuroimmunol 2013;256:94-6. 24. DeFelipe-Mimbrera A, Masjuan J, Corral I, Villar LM, Graus F, Garcia-Barragan N. Opsoclonus-myoclonus syndrome and limbic encephalitis associated with GABAB receptor antibodies in CSF. J Neuroimmunol 2014;272:91-3. 25. Farrant M, Nusser Z. Variations on an inhibitory theme: phasic and tonic activation of GABA(A) receptors. Nat Rev Neurosci 2005;6:215-29. 26. Tretter V, Moss SJ. GABA(A) receptor dynamics and constructing GABAergic synapses. Front Mol Neurosci 2008;1:7. 27. Benarroch EE. GABAA receptor heterogeneity, function, and implications for epilepsy. Neurology 2007;68:612-4. 28. Macdonald RL, Kang JQ, Gallagher MJ. Mutations in GABAA receptor subunits associated with genetic epilepsies. J Physiol 2010;588:1861-9. 29. Tanaka M, Olsen RW, Medina MT, Schwartz E, Alonso ME, Duron RM, Castro-Ortega R, Martinez-Juarez IE, Pascual-Castroviejo I, Machado-Salas J, Silva R, Bailey JN, Bai D, Ochoa A, Jara-Prado A, Pineda G, Macdonald RL, Delgado-Escueta AV. Hyperglycosylation and reduced GABA currents of mutated GABRB3 polypeptide in remitting childhood absence epilepsy. Am J Hum Genet 2008;82:1249-61. 30. Macdonald RL, Kelly KM. Antiepileptic drug mechanisms of action. Epilepsia 1995;36 Suppl 2:S2-12. 31. Gonzalez MI. The possible role of GABAA receptors and gephyrin in epileptogenesis. Front Cell Neurosci 2013;7:113. 32. Ohkawa T, Satake S, Yokoi N, Miyazaki Y, Ohshita T, Sobue G, Takashima H, Watanabe O, Fukata Y, Fukata M. Identification and characterization of GABA(A) receptor autoantibodies in autoimmune encephalitis. J Neurosci 2014;34:8151-63. 33. Petit-Pedrol M, Armangue T, Peng X, Bataller L, Cellucci T, Davis R, McCracken L, Martinez-Hernandez E, Mason WP, Kruer MC, Ritacco DG, Grisold W, Meaney BF, Alcala C, Sillevis-Smitt P, Titulaer MJ, Balice-Gordon R, Graus F, Dalmau J. Encephalitis with refractory seizures, status epilepticus, and antibodies to the GABAA receptor: a case series, characterisation of the antigen, and analysis of the effects of antibodies. Lancet Neurol 2014;13:276-86. 34. Benarroch EE. Glycine and its synaptic interactions: functional and clinical implications. Neurology 2011;77:677-83. 35. Martinez-Martinez P, Molenaar PC, Losen M, de Baets MH. Glycine receptor antibodies in PERM: a new channelopathy. Brain 2014;137:2115-6. 36. Chung SK, Vanbellinghen JF, Mullins JG, Robinson A, Hantke J, Hammond CL, Gilbert DF, Freilinger M, Ryan M, Kruer MC, Masri A, Gurses C, Ferrie C, Harvey K, Shiang R, Christodoulou J, Andermann F, Andermann E, Thomas RH, Harvey RJ, Lynch JW, Rees MI. Pathophysiological mechanisms of dominant and recessive GLRA1 mutations in hyperekplexia. J Neurosci 2010;30:9612-20. 37. Legendre P. The glycinergic inhibitory synapse. Cell Mol Life Sci 2001;58:760-93. 38. Waldvogel HJ, Baer K, Eady E, Allen KL, Gilbert RT, Mohler H, Rees MI, Nicholson LF, Faull RL. Differential localization of gamma-aminobutyric acid type A and glycine receptor subunits and gephyrin in the human pons, medulla oblongata and uppermost cervical segment of the spinal cord: an immunohistochemical study. J Comp Neurol 2010;518:305-28. 39. Carvajal-Gonzalez A, Leite MI, Waters P, Woodhall M, Coutinho E, Balint B, Lang B, Pettingill P, Carr A, Sheerin UM, Press R, Lunn MP, Lim M, Maddison P, Meinck HM, Vandenberghe W, Vincent A. Glycine receptor antibodies in PERM and related syndromes: characteristics, clinical features and outcomes. Brain 2014;137:2178-92. 40. Butler MH, Hayashi A, Ohkoshi N, Villmann C, Becker CM, Feng G, De Camilli P, Solimena M. Autoimmunity to gephyrin in Stiff-man syndrome. Neuron 2000;26:307-12. 41. Hutchinson M, Waters P, McHugh J, Gorman G, O'Riordan S, Connolly S, Hager H, Yu P, Becker CM, Vincent A. Progressive encephalomyelitis, rigidity, and myoclonus: a novel glycine receptor antibody. Neurology 2008;71:1291-2. 42. McKeon A, Martinez-Hernandez E, Lancaster E, Matsumoto JY, Harvey RJ, McEvoy KM, Pittock SJ, Lennon VA, Dalmau J. Glycine receptor autoimmune spectrum with Stiff-man syndrome phenotype. JAMA Neurol 2013;70:44-50. 43. Moersch FP, Woltman HW. Progressive fluctuating muscular rigidity and spasm ("stiff-man" syndrome); report of a case and some observations in 13 other cases. Proc Staff Meet Mayo Clin 1956;31:421-7. 44. Molina JA, Porta J, Garcia-Morales I, Bermejo PF, Jimenez-Jimenez FJ. Treatment with intravenous prednisone and immunoglobin in a case of progressive encephalomyelitis with rigidity. J Neurol Neurosurg Psychiatry 2000;68:395-6. 45. Whiteley AM, Swash M, Urich H. Progressive encephalomyelitis with rigidity. Brain 1976;99:27-42. 46. Campbell AM, Garland H. Subacute myoclonic spinal neuronitis. J Neurol Neurosurg Psychiatry 1956;19:268-74. 47. Solimena M, Folli F, Denis-Donini S, Comi GC, Pozza G, De Camilli P, Vicari AM. Autoantibodies to glutamic acid decarboxylase in a patient with Stiff-man syndrome, epilepsy, and type I diabetes mellitus. N Engl J Med 1988;318:1012-20. 48. McKeon A, Robinson MT, McEvoy KM, Matsumoto JY, Lennon VA, Ahlskog JE, Pittock SJ. Stiff-man syndrome and variants: clinical course, treatments, and outcomes. Arch Neurol 2012;69:230-8. 49. Pittock SJ, Lucchinetti CF, Parisi JE, Benarroch EE, Mokri B, Stephan CL, Kim KK, Kilimann MW, Lennon VA. Amphiphysin autoimmunity: paraneoplastic accompaniments. Ann Neurol 2005;58:96-107. 50. Baizabal-Carvallo JF, Jankovic J. Stiff-person syndrome: insights into a complex autoimmune disorder. J Neurol Neurosurg Psychiatry 2015;86:840-8. 51. Pleasure D. GlyRalpha1, GAD65, amphiphysin, and gephyrin autoantibodies: leading or supporting roles in stiff-person disorders? JAMA Neurol 2013;70:16-7. 52. Woodhall M, Coban A, Waters P, Ekizoglu E, Kurtuncu M, Shugaiv E, Turkoglu R, Akman-Demir G, Eraksoy M, Vincent A, Tuzun E. Glycine receptor and myelin oligodendrocyte glycoprotein antibodies in Turkish patients with neuromyelitis optica. J Neurol Sci 2013;335:221-3. 53. Martinez-Hernandez E, Sepulveda M, Rostasy K, Hoftberger R, Graus F, Harvey RJ, Saiz A, Dalmau J. Antibodies to aquaporin 4, myelin-oligodendrocyte glycoprotein, and the glycine receptor alpha1 subunit in patients with isolated optic neuritis. JAMA Neurol 2015;72:187-93. 54. Ekizoglu E, Tuzun E, Woodhall M, Lang B, Jacobson L, Icoz S, Bebek N, Gurses C, Gokyigit A, Waters P, Vincent A, Baykan B. Investigation of neuronal autoantibodies in two different focal epilepsy syndromes. Epilepsia 2014;55:414-22. 55. Turner MR, Irani SR, Leite MI, Nithi K, Vincent A, Ansorge O. Progressive encephalomyelitis with rigidity and myoclonus: glycine and NMDA receptor antibodies. Neurology 2011;77:439-43. 56. Stern WM, Howard R, Chalmers RM, Woodhall MR, Waters P, Vincent A, Wickremaratchi MM. Glycine receptor antibody mediated Progressive Encephalomyelitis with Rigidity and Myoclonus (PERM): a rare but treatable neurological syndrome. Pract Neurol 2014;14:123-7. 57. Derksen A, Stettner M, Stocker W, Seitz RJ. Antiglycine receptor-related stiff limb syndrome in a patient with chronic lymphocytic leukaemia. BMJ Case Rep 2013; doi: 10.1136/bcr-2013-008667. 58. Kyskan R, Chapman K, Mattman A, Sin D. Antiglycine receptor antibody and encephalomyelitis with rigidity and myoclonus (PERM) related to small cell lung cancer. BMJ Case Rep 2013; doi: 10.1136/bcr-2013-010027. 59. Zuliani L, Ferlazzo E, Andrigo C, Casano A, Cianci V, Zoccarato M, Leite MI, Waters P, Woodhall M, Della Mora E, Morra M, Giometto B, Aguglia U, Vincent A. Glycine receptor antibodies in 2 cases of new, adult-onset epilepsy. Neurol Neuroimmunol Neuroinflamm 2014;1:e16. 60. Clerinx K, Breban T, Schrooten M, Leite MI, Vincent A, Verschakelen J, Tousseyn T, Vandenberghe W. Progressive encephalomyelitis with rigidity and myoclonus: resolution after thymectomy. Neurology 2011;76:303-4. 61. Titulaer MJ, McCracken L, Gabilondo I, Armangue T, Glaser C, Iizuka T, Honig LS, Benseler SM, Kawachi I, Martinez-Hernandez E, Aguilar E, Gresa-Arribas N, Ryan-Florance N, Torrents A, Saiz A, Rosenfeld MR, Balice-Gordon R, Graus F, Dalmau J. Treatment and prognostic factors for long-term outcome in patients with anti-NMDA receptor encephalitis: an observational cohort study. Lancet Neurol 2013;12:157-65. 62. Zuliani L, Graus F, Giometto B, Bien C, Vincent A. Central nervous system neuronal surface antibody associated syndromes: review and guidelines for recognition. J Neurol Neurosurg Psychiatry 2012;83:638-45. 63. Toledano M, Britton JW, McKeon A, Shin C, Lennon VA, Quek AM, So E, Worrell GA, Cascino GD, Klein CJ, Lagerlund TD, Wirrell EC, Nickels KC, Pittock SJ. Utility of an immunotherapy trial in evaluating patients with presumed autoimmune epilepsy. Neurology 2014;82:1578-86. A case report of anti-N-methyl-d-aspartate receptor autoimmune encephalitis with sensory attack. Is limbic encephalitis only "limbic"?